The Heartland Film Festival celebrated and honored the world’s most talented and inspiring independent filmmakers during the 21st Annual Heartland Film Festival Awards Ceremony at the Old National Centre last night. The glamorous event was emceed by Michael Grady, Indiana Pacers/Indiana Fever emcee and ESPN Radio personality, and introduced by Indianapolis Mayor Greg Ballard. Special guest presenters included Greg Paul (President, Castle Rock Entertainment and Trustee of the Stewart Foundation), screenwriter Angelo Pizzo (Rudy, Hoosiers) and Corbin Bernsen. Check out event photos on Facebook. “For 21 years we have had the incredible opportunity at Heartland to inspire filmmakers and audiences through the transformative power of film. 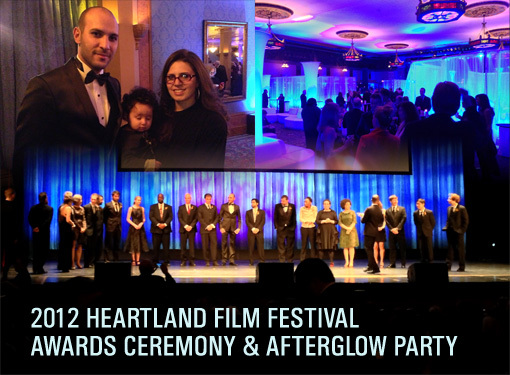 We honor these independent filmmakers and recognize them for their significant contribution to the mission of Heartland Truly Moving Pictures,” said Jeffrey L. Sparks, president and CEO of Heartland Truly Moving Pictures. The stories of three women of different social classes unfold as they unite in their search for justice from the daily plight of sexual harassment in Egypt. Fayza, a conservative mother of two, violently takes matters into her own hands; Seba, an affluent jewelry designer and victim to a gang attack, lectures women on retaliating against these vulgar acts; and Nelly, an amateur stand-up comedian, gets nationally condemned for being the first Egyptian to file a sexual harassment lawsuit. Fayza emerges as a phantasmal hero, subsequently joined by the other women who aspire to be like her when they realize such violence makes a difference. Cairo 678 is one of those rare films that truly makes a difference in the world; in this case, causing new legislation to be enacted in Egypt to reprimand sexual harassers. Tackling a difficult subject with a beautiful and fluid style, this film is an important reminder of the issues faced by women around the world. Two worlds collide when cycling legend Jock Boyer moves to Rwanda to help the first Rwandan National Cycling Team in their six year journey to the Olympic Games in London. As they set out against impossible odds both Jock and the team find new purpose as they rise from the ashes of their past. While this film follows Jock and the Rwandan riders from improbable beginnings through to international competition, it focuses on the second chances they seize, both in coming back from personal setbacks to overcoming the devastating Rwandan genocide. Beautifully shot, you will be taken in by Jock’s commitment to the team and the riders’ drive to improve and learn to compete against professionals, all the while displaying a determination so beautifully expressed through their winning smiles. The film has been updated to include footage from the London Olympics. Narrated by Forrest Whitaker. After many years of marriage, Walter and Madge have grown apart: he lives on the floor and she lives on the ceiling. When Walter tries to reignite their old romance, their equilibrium comes crashing down and the couple that cannot agree which way is up must find a way put their marriage back together. Also the recipient of the Jimmy Stewart Memorial Crystal Heart Award. Congratulations to all the 2012 Heatland Film Festival filmmakers—your films truly make a difference!